Every review of Annisa I've read starts with the explanation that "annisa" means "women" in Arabic, so I might as well oblige. Now that we got that out of the way, the reason we went to this place was that my date wanted to go to a restaurant run by all women. We had watched the owner/chef Anita Lo's victory over Mario Batali just a couple of weeks prior on Iron Chef America and on that program they mentioned that her restaurant is all women. Or maybe we remembered wrong as the staff there wasn't all women. [Update: I just saw that episode again. They did say she has an "all female staff".] There was a male waiter (he was our waiter, in fact... nice guy) and a bunch of dudes in the kitchen. Okay, to be fair, I don't know if the dudes in the kitchen were cooks or maybe they were just dishwashers or something, especially since I peeked into the kitchen late in the evening when the last dinners had probably been served. At the minimum I know there is one woman cook, and that's the owner Anita. She was in the kitchen that night. The point is, the restaurant is not "all women" as we had believed. Maybe they were talking about the section of her wine list that lists only women vintners. In any case, the girls in my group were slightly disappointed by the presence of boys working in the restaurant. Nevertheless, the service, from the hostess to the waiters, was extremely warm and friendly. And really, if the food is good and the service welcoming, who cares if it's men or women? The small dining room is modern, yet intimate, not stark. The lighting casts a gentle warm glow. The women at the table remarked on how feminine the room felt. The tables are on the small side, but on the other hand, they are generously spaced from one another. You are close to your dining companions, in a way that is intimate, not cramped, and you never feel you are too close to other patrons in the room—no easy feat for such a small restaurant. 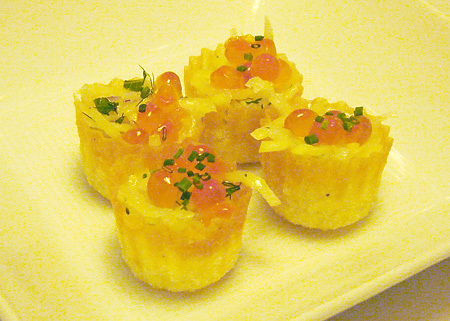 Before we even had a chance to look at the menu, the amuse-bouche appeared on our table. A little hurried, we thought. And nobody we asked seemed to know what's in them. They were so tiny, I barely registered any tastes on my tongue. Okay, now we look at the menu... 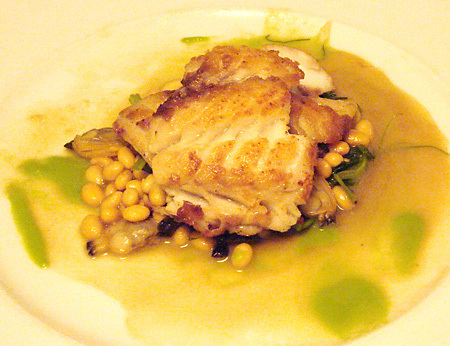 The menu, titled "Spring 2005", was simple with a manageable number of choices. I guess you would call it New American or fusion, but French and Asian accents dominate. 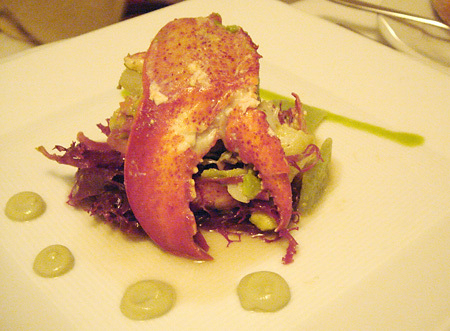 We started with the Salad of Lobster, Avocado and Konnyaku with Lemon Verbena ($17). Right away you see the inclusion of Asian ingredients. Konnyaku, if you are not familiar with it, is a jelly-like Japanese food made from a kind of potato. Surprisingly, the exotic ingredient didn't really elevate this salad into something special. It was really good, the lobster was moist and flavorful, but the dish simply wasn't memorable. I'm writing this a week later and I'm hard pressed to remember how it tasted. 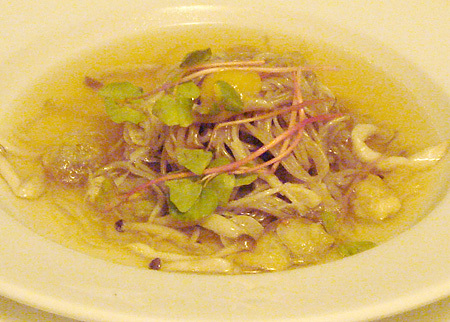 Next, we had the Chilled Korean Buckwheat Noodles and Honshimeji Mushrooms in Broth ($15). Fantastic cold noodles. They tasted like more like soba than the usual Korean cold noodles which are impossible to chew. It would make a lovely summer lunch. 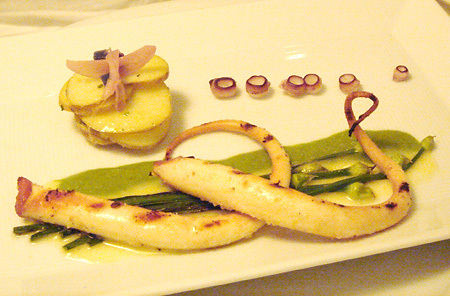 Grilled Octopus with Garlic Chives and Fingerling Potato Salad ($16). First non-Asian course and it's a doozy. Wow. The octopus was so tender and had a wonderful smoked taste. I wonder what kind of smoker they have in the kitchen, but the smokey flavor was amazing. On to the entrees, we start with another smoked dish, Smoked Australian Rack of Lamb with Iroquois Hominy (a type of corn), Chili and Lime ($33). Again, the dish was infused with this delicious, rich smokey flavor. The lamb, while not gamey, was cooked a tad too rare for some in our group. Others, myself included, thought it was fine. I thought the dish is good overall, but I don't know if I would want to eat the entire thing myself without sharing. That's just a lot of raw-ish lamb to eat for one person, no matter how nice and smokey it tasted. 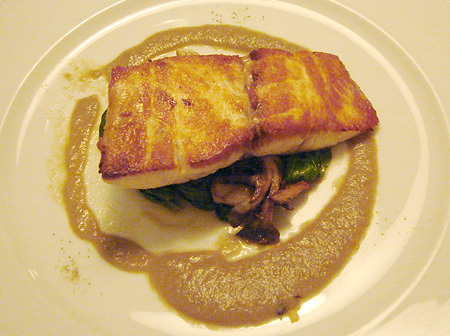 My own dish was the Seared Hiramasa with Hen of the Woods Mushrooms and Sautéed Spinach ($31). The waiter explained that hiramasa is a type of yellowtail that is caught off the coast of somewhere or another (sorry, didn't take notes). We were expecting it to be a filet that is seared on the outside, and slightly raw in the middle, but it came fully cooked through. And take away all the fancy names (hiramasa, hen of the woods) and all you're left with is something that tasted basically like your average hamachi kama (a Japanese dish I happen to love). Very, very good hamachi kama, but nothing extraordinary, either. The other fish dish we ordered, however, was great. The Sautéed Filet of Hake with Chinese Cured Pork Belly, White Soy Beans and Manila Clams ($25) had a fantastic texture and is perfectly cooked. The pork belly and clams gave the filet just the right flavor contrast. Wonderful dish. 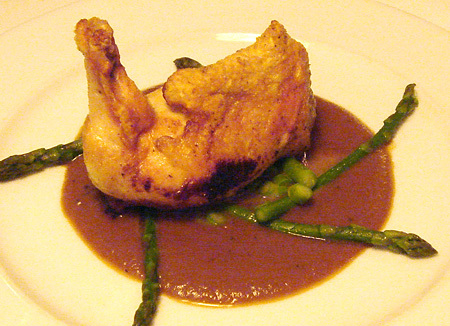 The Pan Roasted Farm Chicken with Sherry, White Truffle and Pig Feet ($24) didn't wow anyone (though it sure was purty, wasn't it?). You'd think with white truffle and pig feet it would taste more interesting, but it didn't. It was good, but at this level of dining, I want more than good. I want to be shown some unexpected interplay of textures and flavors. My "complaints" so far, if you can call it that, have been that several of the dishes were not special enough. But, you know, it's a common problem I have with most New American restaurants. Too frequently, the tastes are just too bland and uninteresting for me that not more than a day later, I would hardly be able to recall what I just ate. In any case, the food at Annisa was more than fine. Nothing offended me (and you should know that I'm easily offended by poor cooking) and everything was beautifully presented. A few of the dishes were memorable and that's really all I ask for in a restaurant these days: Don's piss me off and show me a couple of interesting tastes. Before I end the review, here are the desserts we had. 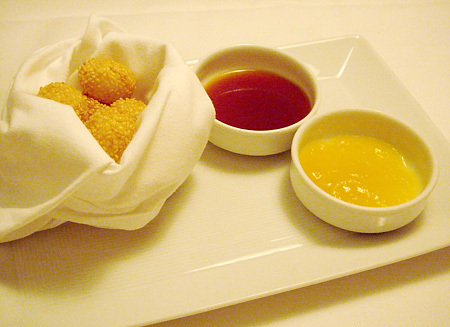 Sesame Mochi with Coconut and Pineapple Dipping Sauces ($9). The mochi was okay, but the coconut-caramel sauce was amazing. The four of us started just eating the sauce with our spoon after we finished the mochi. We ate every last drop of it. 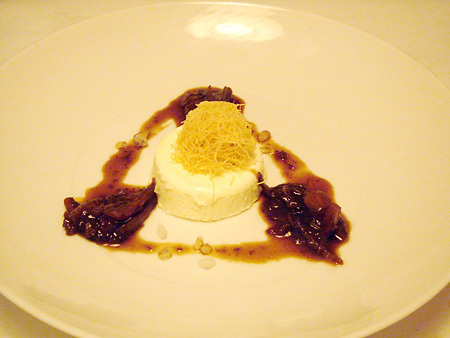 Yogurt Pannacotta ($9). Good. Not the best nor the worst I've had. And here are the petit fours to cap our meal. From left to right: cold chocolate truffles, candied ginger, and lychee popsicles. The popsicles were really good. A fun way to end the meal. Dinner for four with a modest bottle of wine was $300, after tax and tips. 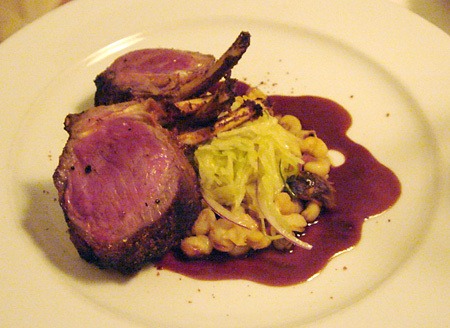 Annisa, 13 Barrow Street (between West 4th and Bleecker), (212) 741-6699.